Viralheat, the affordable social media measurement product that scours social video websites including YouTube, Hulu and Vimeo, blogs, and Twitter to deliver real-time results of consumer generated content on the web, is announcing a few new integrations today. You can read our initial review of the site here. Viralheat is making its platform more comprehensive by now allowing users to track mentions on Facebook. The platform now allows brands, agencies, and marketers to measure impact on Facebook by culling total shares, likes, comments, updates and more. Viralheat is also boosting its analysis of “influencers,” or the people talking about a brand on a given social media site. Viralheat now offers a complete 360-degree view of any author, with a map of an influencer’s reach across various social media platforms and services. 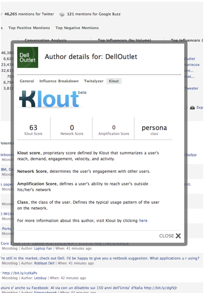 With an integration with Klout, a startup that measures influence across Twitter, Viralheat allows agencies and marketers to look at a user’s behavior and give the users a score based upon influence. Additionally, Viralheat has integrated with Twitalyzer, a similar analytics application that measures Twitter users’ influence by number of retweets, followers, and more. The competition is steep in the social media space, with Viralheat competing with a plethora of startups and companies, including Radian6, Visible Measures, Omgili, ScoutLabs, and Omniture. . One advantage of Viralheat is its price. The site is affordable—for $10 per month, you can track 10 profiles on the site. For $40 per month, you can track 50 profiles.